Credit: By cyanpic on Flickr. Some rights reserved. The number of apps that require users to hold their phones vertically to film has been growing steadily, with Periscope, Meerkat and Snapchat all headline-making examples. Vertical video is becoming harder to ignore by media outlets who have so far preferred their eyewitness contributions and footage from mobile reporters to be shot in landscape mode. "When we dismiss it as an amateurish way to shoot, I think we're missing an opportunity to tell stories in a whole new way, with a whole new artistic visual language," said Zena Barakat, John S Knight Journalism Fellow at Stanford University, in a recent Journalism.co.uk podcast. She also explained how it may be "kinder to the viewer" if they are watching on mobile to offer vertical video. The way people usually hold their phones, as well as the app world which is designed with a vertical orientation in mind, she said, means vertical video transfers to smartphones "in a more native, logical way". "I think this is going to be an awkward transition for content makers," she said, "but we can't ignore that more and more people are watching content on mobile." Broadcasters like the BBC have been traditionally bound by their outlets when it comes to working with vertical video – think the horizontal orientation of TV and desktop. Vertical video on a horizontal screen doesn't always look that appealing. YouTube, for example, displays black bars either side of the video, but there are other players such as Vimeo that support vertical video. "If YouTube were to create a player that could host vertical video in a more native way, that would take out those black bars like these other players have done... then I think people wouldn't associate vertical with an ugly looking screen," said Barakat. Figuring out a way to use vertical video from outside sources is proving a big challenge for mainstream broadcasters. But when vertical video may be preferable for mobile viewers as well the format is becoming difficult to dismiss. "We can't be entirely immune to the growth of vertical orientation," explained BBC smartphone trainer Marc Settle. "It is how people hold their phones. It's not how traditional broadcasters would like them to hold their phones, but as change is happening, do we need to go along with it? "I think that probably needs to be the case now," he told Journalism.co.uk in the podcast. Creating vertical video is going to involve "a new grammar, a new language of putting together footage", he said, and it won't be a short process for mainstream broadcasters who need to adapt. But newer media outlets that aren't necessarily bound by a format they have been using since they first went on air many decades ago could make this transition more quickly. "It is a very exciting time", he said. Mobile journalism expert Robb Montgomery has been experimenting with vertical video as the format has become "part of the language with mobile storytelling", he said in the podcast. Aside from making sure your video is as stable as possible by using tripods, when appropriate, keeping most of your frame still is one way to go – imagine a timelapse of a countryside landscape where only the clouds are moving past. "That works a lot better than full motion walk-through 'making people wanna vomit' video tours with livestream apps, which is a lot of the stuff we're seeing right now," he explained. Another way of experimenting with vertical is dividing the screen into separate panels, which can also be a good way to incorporate landscape video into a vertical frame. Having a talking head in the top section of the screen and a static panel with data or bullet points, or even a video in the lower panel is an option. "[This] certainly would work for a news report, a news bulletin," he said, "it can work for a lecture, it can work for guitar lessons, can work for a lot of different ideas." But vertical video poses a number of questions when it comes to interviews, where the grammar of the shot is well established in a horizontal format. Where do you get your interviewee to look in a vertical frame? And how does it work when you'd like two people in shot – "it seems like it's going to be two cramped," he said, outlining the aims of his ongoing experiments with interviews. While solving these problems is an important aspect of working with vertical video, media outlets shouldn't dismiss the opportunity "to explore what beautiful framing you can do vertically," said Barakat. "If we were to make high quality films vertically," she said, "I think we have this whole new visual language to explore and that's exciting to me." 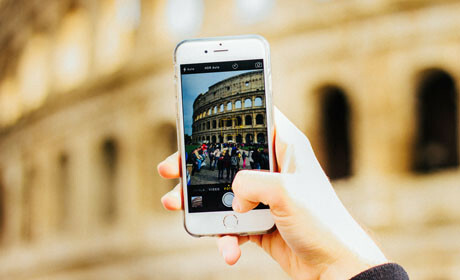 Robb Montgomery is running a Mobile Storytelling Bootcamp for Journalism.co.uk on July 17, where you'll learn how to create professional video packages with your iPhone. Book as part of news:rewired+ here.